Paul The Deacon (720-797?) wrote historical and other works which were widely read in the Middle Ages. Extending Eutropius's 4th-century Roman history, he created an updated version, to the time of the emperor Justinian (died 565). This manuscript is one of only three--all now in the British Library--which are known to have survived from the library of the Carmelite convent at Lincoln. 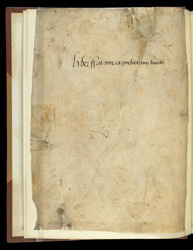 This flyleaf (formerly the pastedown) is inscribed 'Liber Fratrum carmelitarum lincoln.' (the Book of the Carmelite Brothers of Lincoln), and below this there is what must be a shelfmark '.2. V.', perhaps indicating that this was the 2nd book on shelf V.